The Hac Tao hacker profile finally has a model, after first being described by Bostria around the time N3 hit as a profile who no one used to take who would become a monster in N3. He’s what I’d describe as a jack of all trades, master of a whole bunch. There are few situations he doesn’t have an answer for. His stat block has a scary number of 14s in it, his MULTI Rifle can threaten anything within 16 inches, his nanopulser can kill things he can’t see, he can complete objectives and can freeze, designate or possess the scariest models in the game through walls. His hacking device, paired with stealth also ensures he’s dealing with enemy hackers on his own terms in the active turn, whilst his ability to assume a marker state, high willpower, high BTS and access to the Carbonite program keep him safe in the enemy’s active turn. Finally, thanks to hidden deployment, a careless opponent might not even know how much trouble they are in until it’s too late. Model-wise, “super cool” doesn’t even cut it. He is posed with the confidence of someone whose only fear can be summarised as “Intruders”. I love that even though they went with his sword in hand, that the MULTI Rifle is evident on the model. His hack gear gives him a noticeably different geometry compared to his HMG wielding predecessor (Be sure to check out that article for everything you might want to know about the meaning behind the unit’s name!). That said, once I got painted, he started to feel very familiar, and soon they looked like peas in a pod. Here’s hoping you can take two in White Banner! Painting him was fairly straight forward, as there were few colours to figure out that were not used on the first one. Notably I did the crossguard on his oversized Jian exactly as I had done it on the Gūijiă, and the blade the same as the servo muscle. His visor comes from mixing black with a tiny bit of purple and a bit more turquoise, then adding in more white to it as I painted successive layers. That was something of a guess but it worked out all right. Super cool. Yu Jing really is blessed these days. Now I just have to use him quickly before the new Su-Jian comes out drags me back into the murky world of the Imperial Service. …And boy do they look the part. Isn’t it funny that in a hobby of miniatures, it’s still the big ones that get people excited. I’m not gonna lie, I just love everything about the Hac Tao. His profile, his background, his sculpt, all of it. Even the name sounds cool. I know I say this about everything, but the Hac Tao is one of the units that got me into Infinity. Not this particular one of course, who only exploded onto the scene last month. That honour belongs to this classic. Most people, including myself will tell you the HMG profile is the safer option though, and with the unexpected bonus of the Executive Order + HMG profile from N3, this holds truer than ever. He also scored a nanopulser and a points decrease. Needless to say this guy will be a huge boon to my state troops and nascent White Banner Sectorial Army. The grey was a haphazard mix from a pool of Games Workshop Fortress Grey, Skull White and Chaos Black that I dragged the brush through a different way depending on if i was looking to lighten or darken an area. The orange is the usual combo of Vallejo Orange Brown and Scrofulous Brown. I reckon I will be tidying those lines for a couple of weeks though. 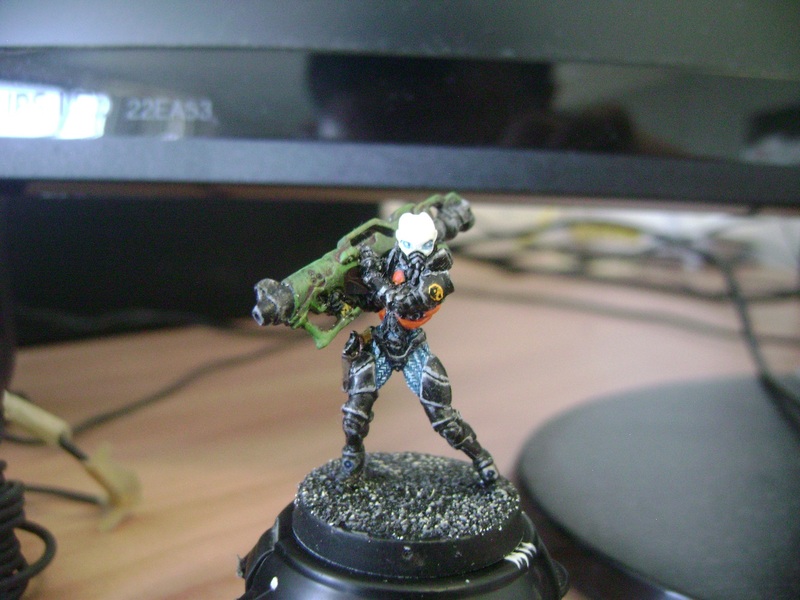 The muscle fibres are Games Workshop Hawk Turquoise with gradually added Skull White. Here is a close up of the effect, from when I did the concept limb to test out the scheme. It’s confusing because “Hac Tao” isn’t really consistent with any current systems for romanising Chinese. A quick search through Google turned up only one use of the “Hac Tao” spelling that wasn’t in relation to Infinity, a page on Encyclopedia Mythica discussing Chinese black magic. The page was created in 1997 and last modified on 2004. Infinity kicked off in 2005 as far as I know so it could have been their source. From all this we can be very clear that the first character is meant to be “黑“, which means black. In Cantonese, 黑 is usually romanised as “Hak” or “Haak”, which is much closer to “Hac” than the Mandarin “hēi”, pronounced similar to the “hey” you would use to get someone’s attention. As for Tao, it’s clear from the unit’s description and the big Yin-Yang insignia that this refers to Taoism. “Tao” itself is an early romanisation of 道/Dào, literally meaning “the way”. That’s from mandarin however, if we want to be consistent, the Cantonese pronunciation of 道 is “Dou”, similar to the dough you’d use for making bread. In summary, the mandarin name would be “Hēi Dào”, the Cantonese name would be “Hak Dou”. Probably best to stick to the Infinity International Standard Code (ISC), since everyone who has ever read the words “Hac Tao” pronounced it the same way anyway. The unit logo also includes some Chinese characters to look at. The bottom reads “玉京/Yu Jing“, as I am sure everyone knows by now. The top reads “特殊单位/Tèshū dānwèi“, which means “Special Unit”, in line with the unit’s full ISC, Hac Tao Special Unit. I started collecting Infinity before I started this blog. 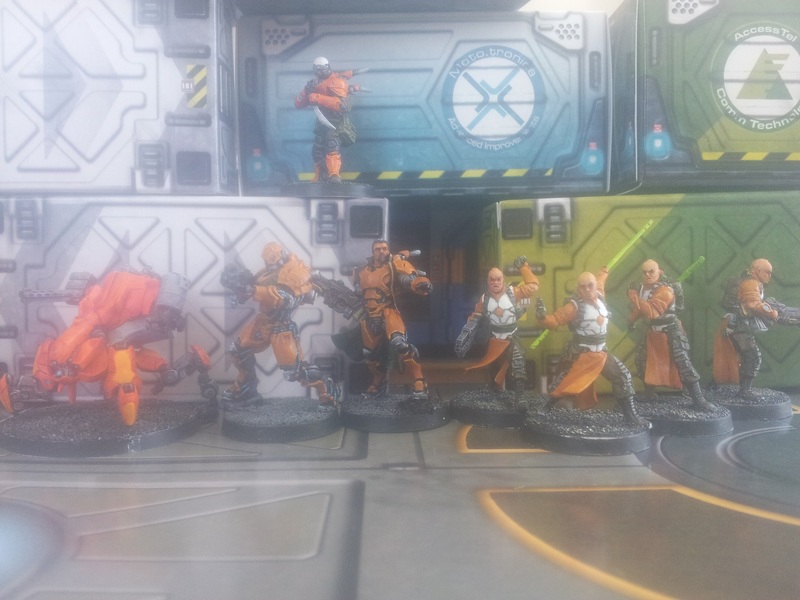 I’m hoping to go back over my early experiences in time, my old paint jobs and so on to make this blog a complete account of my experience collecting Yu Jing for Infinity. I will do this at the same time as I add posts about what has been going with my battlegroup recently.